Chang Jo-yoon’s debut for Hougang United FC was overshadowed by Jonathan Behe, whose late goal ensured Warriors FC claimed a valuable 2-1 away win at Hougang Stadium on Wednesday night. Hougang thought they had done enough to earn a point after Iqbal Hussain netted early in the second half to cancel out Kento Fukuda’s first-half opener for the Warriors. However, Behe scored 12 minutes from time for his 14th goal of the season, earning his side a third consecutive Great Eastern-Hyundai Singapore Premier League (SPL) win in the process. 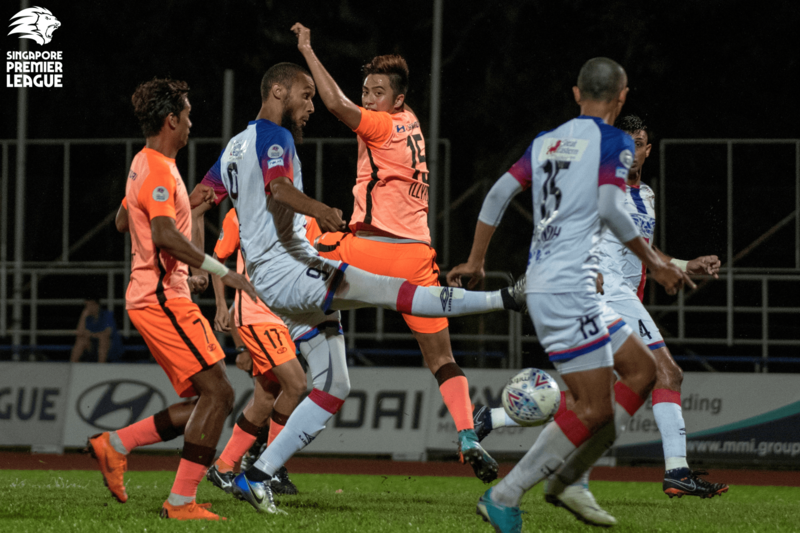 The result left Hougang 10 points adrift at the bottom, while Warriors now have a five-point gap between them and sixth-placed Balestier Khalsa FC. Hougang started off the more energetic of the two sides and could have scored after just four minutes. However, loan signing Fazrul Nawaz volleyed wide from range after receiving Fareez Farhan’s knock-on. Then, Warriors gradually settled in and opened the scoring on 17 minutes. Tajeli’s precise out-swinging corner picked out Fukuda, whose stooping header evaded goalkeeper Khairulhin Khalid before flying into the bottom right corner for his second goal in as many games. Hougang were stung into action and created a glut of opportunities thereafter. First, it was Captain Nurhilmi Jasni who scuffed a volley over from just outside the area in the 19th minute after being teed up by Antoine Viterale. Two minutes later, Fareez shot over from ten yards after Fazrul did well to draw away a couple of defenders in the area. The best chance came on 25 minutes when Viterale was sent through on goal by a superb Fazrul through ball, but the French-Italian forward shot wide of the left-hand post with just Warriors custodian Mukundan Maran to beat. The Cheetahs carried that momentum into the second half and duly grabbed a deserved equaliser three minutes after the restart. The hardworking Fazrul worked out some space on the edge of the box for Iqbal, who then advanced into the area and ended a seven-game goal drought with a fierce snapshot. Clement Teo’s charges could made it 2-1 on 52 minutes, but Fazrul was twice denied by Mukundan after going clear. The visiting Warriors also had their chances, but Behe twice spurned teasing right-wing deliveries from Emmeric Ong. Going for the jugular, Hougang threw on new signing Chang to replace Fareez for the last 20 minutes and they nearly netted on 76 minutes. Nurhilmi raced half of the pitch following a breakaway, before thrashing the ball over the bar from just outside the area. They were made to pay for that miss as the Warriors went on to score the winning goal two minutes later. From a long ball, Behe expertly sidestepped the onrushing Khairulhin before slotting home into an empty net to send the visiting fans into ruptures. Hougang kept pushing in the dying stages, but Mukundan stood strong to repel efforts from Chang and Iqbal to preserve the points for his side. Hougang have little time to rest as they travel to Bedok Stadium to face Geylang International FC in a rescheduled game on Sunday, while Warriors enjoy a two-week break before hosting Tampines Rovers FC on Wednesday 15 August. Hougang Caretaker Head Coach Teo: “Honestly, I cannot ask for more. The players showed a fantastic mentality and we kept pushing – I’m proud of them. Apart from the goals, Warriors did not threaten us at all. This is football. Warriors Head Coach Mirko Grabovac: “In the SPL, you have to concentrate for 90 minutes. Hougang have many good players, but we were the better team tonight. We were disciplined – just that for some parts of the game, some of the players were playing for themselves instead of playing for the team. Hougang: Khairulhin Khalid (GK), Muhaimin Suhaimi, Illyas Lee, Fabian Kwok, Faiz Salleh, Justin Hui (Syukri Bashir 83’), Antoine Viterale (Stanely Ng 76’), Iqbal Hussain, Nurhilmi Jasni (C), Fareez Farhan (Chang Jo-yoon 70’), Fazrul Nawaz. Unused subs: Zulfairuuz Rudy (GK), Ashrul Syafeeq, Syahiran Miswan, Syaqir Sulaiman. Warriors: Mukundan Maran (GK), Emmeric Ong, Delwinder Singh, Kento Fukuda (C), Daniel Shafiq (Firdaus Kasman 51’), Fadhil Noh (Poh Yi Feng 65’), Ismadi Mukhtar, Ammirul Emmran, Sahil Suhaimi, Tajeli Salamat (Ignatius Ang 79’), Jonathan Behe. Unused subs: Fashah Iskandar (GK), Hafiz Sulaiman, Nur Luqman, Suria Prakash.